For his son, also a boxer, see Chris Eubank Jr. For the tennis player, see Christopher Eubanks. Christopher Livingstone Eubank (born 8 August 1966) is a British former professional boxer who competed from 1985 to 1998. He held the WBO middleweight and super-middleweight titles between 1990 and 1995, and is ranked by BoxRec as the third best British super-middleweight boxer of all time. He reigned as world champion for over five years, was undefeated in his first ten years as a professional, and remained undefeated at middleweight. His world title contests against fellow Britons Nigel Benn and Michael Watson helped British boxing ride a peak of popularity in the 1990s, with Eubank's eccentric personality making him one of the most recognisable celebrities of the period. In his final two years of boxing he challenged then-up and coming contender Joe Calzaghe in a bid to reclaim his WBO super-middleweight title, with a victorious Calzaghe later claiming that it was the toughest fight of his whole career. Eubank's last two fights were against WBO junior-heavyweight champion Carl Thompson, both of which were brutal encounters. In the rematch, Eubank was stopped for the first and only time in his career. Eubank is credited for his bravery in the ring, in which he was able to take considerable amounts of punishment from power punchers en route to his victories and defeats, and for this he is said to have a "granite" chin. His son, Chris Eubank Jr., is also a professional boxer. 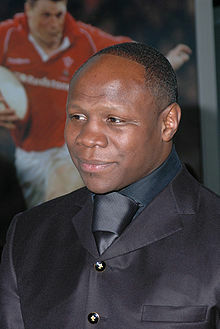 Eubank, was born on 8 August 1966, in Dulwich, South London, to Rachel Scollins. From two months to six years old he was raised in Jamaica. On his return to England, he lived in Stoke Newington, Dalston, Hackney and then Peckham, in a largely impoverished environment. He attended Northwold Primary School in Upper Clapton, Bellingden Junior School, and then Thomas Calton Secondary School in Peckham, from where he was suspended eighteen times in one year and then expelled, despite claiming he was gallantly trying to protect other children from bullies. Some time was spent at Orchard Lodge Regional Resource Centre, Anerley, in 1981. When he was 16, his father sent him to New York in the U.S. to live with his mother in the tough South Bronx district. Eubank made a fresh start in New York, battling drug, alcohol and shoplifting addictions to attend church and school. In his spare time he trained at the Jerome Boxing Club on Westchester Avenue, following in the footsteps of his boxing elder brothers (twins, Peter and Simon Eubanks) back in England. Eubank became obsessed with boxing training and went to the gym every day, even working as caretaker to pay his way. He won the 1984 Spanish Golden Gloves Tournament and also got to the semi-final stage of the main Golden Gloves tourney at Madison Square Garden at aged 18. He writes in his autobiography that his drive to succeed in boxing came through his drive to become an accepted individual, largely caused by subjective bullying from his elder brothers. He made his professional debut at the Atlantis Hotel and Casino against Tim Brown, shortly after his 19th birthday. Although his next 10 fights went largely unnoticed, then in February 1989 he made brief headlines in defeating Jamaican Anthony Logan in an undercard match to a Nigel Benn-headlined show. Benn was arguably the biggest rising star in European sport at the time and Logan had come closest to beating the power-punching Benn in what was Benn's most memorable clash to date. Eubank had already made Brighton in England his adopted hometown and set his sights on Benn, believing he could beat him. After a string of impressive stoppage victories following a dominant 10-round decision over American gatekeeper/journeyman Randy Smith, Eubank captured the WBC International title in 1990 against Hugo Corti. Later in the year, he knocked out Renaldo Dos Santos in precisely 20 seconds (including the 10-count). Eubank won the WBO middleweight title against Nigel Benn (and the odds) in a classic encounter that was later released on DVD: a gruelling battle which ended when Benn (ahead on points, but only narrowly) was stopped on his feet near the end of round 9. Eubank would defend the title successfully against Dan Sherry (in a fight cut short by a headbutt, for which Eubank was penalised 2 points but still won on points over the 9 completed rounds), fellow Briton Gary Stretch and finally in an excellent match with another fellow Briton, Michael Watson, fighting him to a narrow 12-round majority decision in Eubank's favour. This concluded Eubank's career as a middleweight, with a 28–0 record. A rematch with Watson for the vacant WBO super-middleweight title took place in September 1991, in which Watson suffered a near-fatal injury. Eubank was behind on all scorecards after 10 rounds, and was knocked down 18 seconds from the end of the round. He rose from the canvas (being given only a standing four-count instead of eight) to unleash a devastating uppercut to Watson's jaw right at the end of the round, knocking Watson's head and neck backwards into the ring ropes. The bell sounded to end the round as soon as Watson was up from the count. It was still obvious to all observers – and to Eubank himself – that he needed a knockout to win: and early in the 12th, with Watson still visibly shaken, the fight was stopped with Watson under a flurry of punches from Eubank. Soon after the fight Watson collapsed in his corner. His condition may have been worsened by delay in receiving medical attention: there was no ambulance or paramedic at the event and after eight minutes on the ring floor, Watson was attended by doctors wearing dinner jackets, arriving late. Following the fight, Eubank contemplated quitting the sport. Commentator Reg Gutteridge said, in the moment, he had, "never seen a more dramatic end to a world title fight". Eubank later reflected on the aftermath: "I lost my finishing instinct in the ring – I couldn't finish fights any more. However, I needed to work and so I carried on and I won most of my fights on decisions. And I blamed myself, after all, it was me who threw the punch." Eubank was particularly noted for his confidence, concentration, composure, and extravagant behaviour, and antics that included a vault over the top-rope into the ring before each fight. His trademark theme tune was Tina Turner's Simply the Best. He would often engage in posturing (particularly between rounds of fights). Eubank was by now presented as something of a "man you love to hate" figure in the British tabloid press because of his perceived arrogance and for his singularly unconventional sense of style. In boxing circles he enjoyed even less popularity, having once referred to the sport as a 'mug's game' on national television (This was a selective quote – Eubank had actually been discussing the seedier side of the sport, such as the beatings taken by journeyman fighters for small sums of money, or boxers that were lied to and ripped off by promoters). Now the holder of a second title, Eubank relinquished his middleweight title and concentrated on defending his new crown at the higher weight of 12 st. After the Watson tragedy Eubank never again showed any desire to knock opponents out, preferring to retain his title through points victories. He made successful defences against "Sugarboy" Malinga, the American quartet of John Jarvis, Ron Essett, Tony Thornton and former World Champion Lindell Holmes, as well as Juan Carlos Giminez Ferreyra and a draw with fellow Briton Ray Close. Nigel Benn moved up to super middleweight and became WBC champion. The pair agreed to meet in a WBC/WBO unification rematch. In 1993 the rivals would engage in another contest named 'Judgement Day' watched by a reported 500 million people and fought an exciting contest – albeit less brutal than their first – to a draw. Don King had negotiated the contracts so that he would own both the winner and the loser of Eubank v Benn 2. Barry Hearn claimed that, as a draw was not written into the contract, Eubank was free to sign a new deal with him instead of King. He did – and Benn also did not sign for King, on the same pretext. Following the Benn fight, Eubank went on to defeat Graciano Rocchigiani of Germany, the undefeated former IBF super-middleweight title holder. After a split points victory over Ray Close, in the King's Hall Belfast, Eubank signed an eight-fight £10-million deal with Sky Sports for contests in South Africa, Manchester, London and Millstreet. Eubank made five further successful defences, beating British world title contenders Henry Wharton and Sam Storey as well as unbeaten Dan Schommer and Mauricio Amaral Costa. In March 1995, however, Eubank lost his title to Irishman Steve Collins, by unanimous decision. Eubank won an eliminator for his old title against Jose Ignacio Barruetabena, as well as a win over Bruno Ruben Godoy. A rematch with Collins took place in Cork, Ireland, and Eubank lost again by a surprisingly narrow split decision. He announced his retirement from the ring in October 1995. He made a quick comeback in 1996, however, defeating Luis Dionisio Barrera and Camilo Alarcon. After Steve Collins withdrew from his WBO super-middleweight title defence against Joe Calzaghe and unexpectedly retired in October 1997, Calzaghe was matched against Eubank for the vacant title with eleven days notice. Eubank had been scheduled to box at light-heavyweight on the undercard. Eubank was knocked down twice and lost on points to Calzaghe, but saw his popularity rise as a result of managing to finish the fight against his more fancied opponent. Eubank then added 20 lbs in weight and challenged Britain's Carl Thompson for the WBO cruiserweight title. Eubank floored Thompson in the fourth round but, as in the first Steve Collins fight, failed to press home his advantage. The fight went the distance, with Thompson's strength and durability eventually telling in the later rounds. Thompson won by unanimous decision, but the closeness of the fight was reflected in the scoring, with two of the three judges giving the fight to Thompson by a single point. A rematch was quickly arranged for three months later and they again fought for the WBO cruiserweight championship in what turned out to be Eubank's last fight. Eubank had the better of the fight early in the rematch, but the short rest between the bouts came back to haunt him as his left eye that was damaged in the first fight rapidly began to swell. The fight was stopped at the end of the ninth round, when Eubank's left eye closed completely from swelling. At the time he was ahead on the scorecards. It was the only stoppage loss of Eubank's career spanning 3 weight divisions, 30 pounds and 13 years as professional. Eubank finished his career with a record of 45 wins (23 KOs), 5 losses, and 2 draws. Throughout his successful years and beyond, Eubank developed a reputation for eccentricity. In a poll published by BBC Homes and Antiques magazine in January 2006, Eubank was voted the second most eccentric star (after Björk). Speaking with a lisp and in affected upper-class tones; dressing as a stereotypically upper-class Englishman (in jodhpurs, bowler hat and riding boots; sporting a monocle) and carrying a silver-tipped cane, such affectations have provoked criticism in tabloid newspapers. However, in 1991 and 1993 he won Britain's Best Dressed Man award, given by the Menswear Association of Great Britain. His collection of vehicles included a customised Harley-Davidson and a huge American Peterbilt 379 truck cab – the largest lorry in Europe. At one time he owned the only Hummer in Britain. In the early 1990s, Eubank was caricatured as a puppet on Spitting Image. He featured on the front cover of Esquire for the April 1992 edition. He was mentioned in a scene of I'm Alan Partridge, in which the title character desperately tries to think of ideas for a new television show, one of which is entitled Youth Hosteling with Chris Eubank. He has featured in television advertisements (commercials) for Nescafé, Royal Mail, McDonald's, Jaffa Cakes and Orbit, and has modelled for Vivienne Westwood and Versace. He purchased the lord of the manor rights in Brighton at auction in 1996 and used the ancient right of this position to appoint a town crier in addition to the town crier employed by the local authority. In 1994 he took over a prime site in the city, which he called 'Buckingham Place'. He knocked down the interior whilst keeping the grade II façade intact and built 69 flats for the homeless, using £1,250,000 of his own money. The building was later sold for redevelopment in 2000. In 1996, Eubank was the guest presenter on Top of the Pops. In 1999, he launched the Dreamcast and in the same year, he appeared in his truck in the music video for the song "Turn Around" by Phats & Small. He also had his own show on Talk Radio called Eubank's People. Guests included Linford Christie, John Fashanu, Lennox Lewis, and Naseem Hamed. In 2001, he appeared in the first series of the reality television show Celebrity Big Brother on Channel 4, where he was the first ever celebrity to be evicted from the house. During Michael Watson's recovery from his near-fatal injury during their bout in 1991, Watson and Eubank became friends, with Eubank accompanying Watson for the final mile of the 2003 London Marathon, which Watson – still showing physical damage from the fight and taking more than six days – completed to raise money for charity. In 2006, Eubank was sacked by his own public relations advisor, Richard Hillgrove, for being "too eccentric". In 2015, Eubank took part in the 2015 series of I'm a Celebrity...Get Me Out of Here!. He lasted 17 days and finished in 9th position. In November 2009, Eubank was declared bankrupt, owing £1.3 million in taxes. On 14 October 2003, Eubank was intercepted by police whilst driving around Parliament Square, Westminster, in his truck, which displayed the message "TONY BLAIR! MILITARY OCCUPATION CAUSES TERRORISM". He completed a number of circuits before he was arrested. On 22 February 2007, Eubank was arrested outside Horse Guards Parade in Whitehall for a suspected breach of the peace after driving through central London in his truck, which was emblazoned with a message condemning Tony Blair for sending Prince Harry to Iraq. The banner read "BLAIR – Don't send our young prince to your catastrophic illegal war, to make it look plausible!" On 23 May 2007, he was charged with making an unlawful anti-war protest after parking his seven-ton truck outside Downing Street. On 16 November 2007, he failed to turn up at court, so an arrest warrant was issued, and he was fined. In October 2005, Eubank was appointed as the first ambassador for gambling charity GamCare, to support and encourage responsible gambling. Known for his unique sense of style, Eubank has won the Britain's Best Dressed Man many times. In 2010, Eubank, once a regular customer, started designing tailored suits for Cad and the Dandy, a Savile Row bespoke tailoring company. On 19 August 2015, a spoof trailer was made available for Youth Hostelling with Chris Eubank in association with Hostelworld, detailing Eubank's journey around Britain in an effort to learn more about youth hostels. The joke originates from the comedy show I'm Alan Partridge, in which the title character pitches a selection of ideas for television shows. Eubank and his first wife, Karron (married on 23 December 1990 in Brighton), had four children (Christopher, born on 18 September 1989; Sebastian, born on 18 July 1991; Emily, born on 19 April 1994; and Joseph, born on 23 October 1996) and have over the years starred in various television programmes. Eubank also has a son Nathanael Wilson. In 1992, Eubank was involved in a fatal collision when he lost control of his car on the London to Brighton road; the car came off the road and killed a building site worker. He was convicted of driving without due care and attention, fined £250 plus £1,450 costs, and had six penalty points added to his driving licence. In 2001, Eubank was the subject of a Louis Theroux documentary entitled When Louis Met...Chris Eubank, in which Theroux and his camera crew accompanied Eubank for a period. In 2003, they invited television cameras to follow their lives for nine months; the resulting show, At Home with the Eubanks, was broadcast on Five. Karron petitioned for divorce from Eubank in August 2005. In 2005, Eubank was convicted of taking a vehicle without consent. He had driven a beer lorry which was being unloaded away from a place where he considered it to be causing an unreasonable obstruction. In 2014, Eubank married his manager Claire Geary, but the couple divorced in 2017. In 2015, Eubank adopted the nickname of his deceased father, "English", to privately perpetuate his memory and to publicly differentiate himself from the budding boxing career of his son Chris Jr. The Times, page 22, 2 September 2005. ^ Davies, Gareth A. (23 October 2015). "Chris Eubank changes his name to 'English' – to stop being confused with his son". The Daily Telegraph. Retrieved 25 October 2015. ^ "BoxRec". boxrec.com. Retrieved 21 March 2019. ^ "poll". BBC News. 9 January 2006. Retrieved 4 July 2013. ^ Culf, Andrew (23 February 2007). "Eubank arrested after Whitehall protest over prince's deployment". The Guardian. UK. Retrieved 27 July 2008. ^ Sapsted, David (13 July 2000). "Chris Eubank defends sale of hostel for homeless". The Daily Telegraph. Retrieved 30 September 2014. ^ Fordyce, Tom (19 April 2003). "Poignant end to Watson's epic journey". BBC News. BBC. Retrieved 3 September 2009. ^ "Dragon scorches his media man" by Oliver Duff, in The Independent, 21 March 2007, p. 20. ^ "Eubank too 'eccentric' for his agent" by Guy Adams, in The Independent, 13 July 2006, p. 16. ^ "The Times & The Sunday Times". Timesonline.co.uk. 12 August 2016. Retrieved 17 August 2016. ^ "Indymedia article". Indymedia article. 17 October 2003. Retrieved 4 July 2013. ^ "Eubank arrested in Whitehall demo". BBC News. BBC. 22 February 2007. Retrieved 22 February 2007. ^ "Arrest warrant issued for Eubank". BBC News. 16 November 2007. Retrieved 4 July 2013. ^ Kelly, Stephen (10 August 2015). "Alan Partridge: Chris Eubank doesn't get 'Youth Hosteling with Chis Eubank'". Radiotimes.com. Retrieved 17 August 2016. ^ "Boxer fined for careless driving in fatal crash". The Independent. London. 18 August 1992. Retrieved 4 July 2013. ^ Milmo, Cahal (10 July 2013). "Chris Eubank found guilty of taking a beer delivery truck". The Independent. London. ^ "Chris Eubank marries his manager Claire Geary in Las Vegas". Hello!. 30 April 2015. Retrieved 3 May 2018. ^ Moyes, Stephen (8 July 2017). "DIVORCE KO FOR EUBANK Chris Eubank is divorcing his second wife after their long distance relationship takes its toll". The Sun. News UK. Retrieved 3 May 2018. ^ Davies, Gareth A (23 October 2015). "Chris Eubank changes his name to 'English' - to stop being confused with his son". The Daily Telegraph. Telegraph Media Group. Retrieved 22 January 2019. Wikimedia Commons has media related to Chris Eubank.